Boiling Bagels: what are we trying to achieve here? B) How long do the bagels actually need to boil to attain that aim? According to my reference - the book "Bread, a Baker's Book of Techniques and Recipes" bagels are boiled in water into which malt syrup has been added that will slightly permeate the dough to give it color and shine. The boiling also reactivates the yeast and pre-gelatinizes the starch on the surface of the bagels which contributes to their chewiness. The recommended time in this reference is 45 seconds. So, we are boiling for color, yeast activation, and chewiness. When I am having success, they generally puff and float to the surface. My hands/my levain dough/my altitude I like a minute or more per side, but certainly no more than 2 minutes per side. This gets the best results for me. I don't pretend to be a bagel expert but I boil for about a minute on each side. Sometimes I use just baking soda (2 tsp) in the pot, sometimes I use the malted barley syrup. I think the syrup gives a little color and maybe helps the shine some. I believe the water alone or with a little baking soda helps the shine also. I think you can over do the boiling or simmering. Just a little bit and don't worry to much about how hot it is. Close to a simmer is plenty I think. One thing I know for sure is that the whole process works much better for me if I form the bagel, set it on a sheet pan over paper and give it a rest/rise before putting them in the refrigerator. I always make sure they will pass the float test in cold water, before they go in the cooler. What ever that takes, it's important to getting a nice bloom later. Then the next morning, out of the fridge, a quick boil and into the 500F oven as quickly as I can get it done. Works every time. They will float in the boiling water and not stick, ever. If I'm using seeds. I flip them onto the seed pan with the strainer then out of the seeds and onto the baking sheet pan. I've been making bagels for my local Farmer's Market this year (over 2900 sold since April), I only boil it one minute on a side. 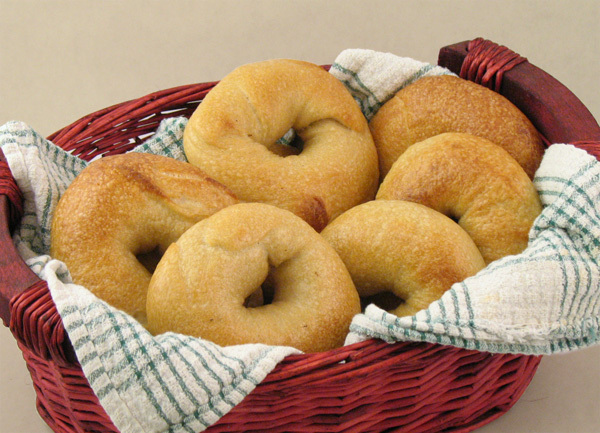 I suggest experimenting and see what you personally like, boiling the bagels different lengths of time in a single batch (if you are baking on parchment, use pencil to mark the boil time of each bagel). I've never tried to see how a longer boil time affects the bagels, when you are doing 12 dozen in a day the last thing you want is to boil them any longer than needed. I made some this past weekend from the reinhart whole grain breads book and i didn't have any barley malt syrup so i just used honey in the soaker, and just the baking soda in the water. Boil them for a total of one minute 30 seconds each side. They came out great, not too tough or dense or chewy infact I think they were just perfect, even my folks liked them who are total white bread people. Although I admit I didn't make the dough quite as stiff and dry as they reccomend because i was hoping to kinda avoid too tough and chewy, but either way these came out lovely. Coated them with sesame seeds and poppy seeds YUM! I was disappointed with my bagels when I formed them, first, and then retarded in the fridge overnight. They came out much "flatter" than I am used to at good bagel shops. Instead, I was pleased when I put the entire batch of dough in the fridge overnight. I took the dough out of the fridge in the morning, formed the bagels, then went on to boiling then baking. Dough was also good and easy to work with while it still had a little chill to it, and nice and tight for shaping. I find the "wrap-around" method is the way to go with a much nicer, more traditional appearance on the finished product. Good luck, and let us know the results of your experiments! but because I was making a rather small batch (eight) I didn't want to go and purposefully mess up a lot of them so I only did a 2 minute boil test on one. There wasn't much difference, maybe a slightly chewier crust? Otherwise it came out pretty much the same as the others. Maybe I'd have to boil for a much shorter time (or not at all) or a very long 3+ minutes to really see the diff. These were done following Mike Avery's Sourdough Bagels recipe off his website. Now that I have a good recipe that makes a fair sized bagel (and not flat) I'll bump up the production to 16 from his original four and then I will have a couple of them to test on. Boiling and then baking is the hallmark of a bagel, so I think skipping the boiling would create some other product. Although it might be a tasty one. Did you use malt or baking powder - or something else? I have found that malt really makes a difference. Another step that is suggested in the "Bread..." book is that after boiling, the bagels are put in a cold water bath for 3-4 mins, then baked. It may sound like one more darned step, but I have found it to be a good one. Good luck on future bagel bakes! I finally found malt extract - not exactly an easy thing to do in these parts, as I found out. No Health Food Store (or rather "boutiques") around here had it except one, they had a 450g jar for $13. However, I also located a wine and beer making store and they had 500g for $2.50. A little more reasonable. I've also been told lye works by a couple of people now, though I haven't heard what it does that Malt doesn't. If I ever happen to come across lye (are there different types?) I might give it a go but it's not on my list of things to hunt for quite yet. So what have you found the cold bath does to the bagels? The cold bath seems to firm them up a bit and give them more chew (my hands/my dough/my altitude). I'm Northeast Corridor born and raised and I like a real "alligator donut" feel to my bagel. You know - that extra 5% of goodness. Not required, but nice. I use non-diastatic malt powder and dissolve quite a bit of it in a glass of water, let it sit for a little while and it turns into syrup. That night be a more reasonable choice for you and easier to find. The water for boiling should have enough malt added so that it looks like tea. You want to get food grade lye, if you use lye. Type "food grade lye" into your favorite search engine and several places that provide it mail order will appear. These are usually places that sell soap making supplies. Lye is traditionally for German pretzels. I have not heard it advocated for bagels, but I will freely admit that I do not know everything. I am sure that it would give the bagels shine and crispness to the crust, but I have no idea if it would give the right "bagel texture." It is something to try if you are so inclined. At least try this, you'll get perfectly boiled bagels. Once your bagels are rolled and ready boil a large pot of water. In that pot add about a 1/4 cup of Honey, not malt. Stir in a tablespoon of salt, I prefer Kosher salt for this. You do not need Malt, just the Honey and Salt. Keep the pot stirred, you'll notice if the Honey is sitting heavily. Boil the bagels 4 at a time so they float freely. 1 minute each side, 2 minutes total. Remove them with a large strainer ladle. Place them on a cooling rack to drip dry just a bit, then add your egg-wash/seeds. While these are baking get more boiling.